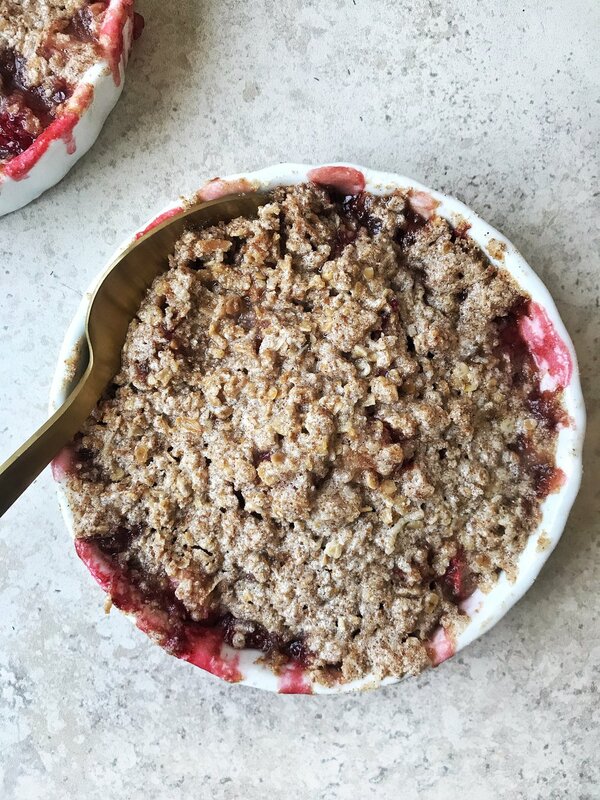 In celebration of Earth Day this year I partnered with my friends at One Degree Organics to bring you this amazing Strawberry Crumble! We got the juiciest, sweetest strawberries from our local farm for the filling (thank goodness for strawberry szn!) For the base of the crumble we used our favorite gluten-free sprouted oats (better nutrient-absorption) from One Degree Organics. One Degree Organics not only is an amazing company that practices sustainable plant-based farming techniques., but they also just got certified glyphosate-free! Glyphosate is the most used pesticide IN THE WORLD & is extremely toxic to our health. So it’s huge to be able to support companies making it a top-priority to attain this certification! On top of that, you can go on the One Degree Organic website & literally see where every single ingredient they source is from around the world, which is amazing! Preheat your oven to 375. Spray two ramekins with avocado oil or coconut oil (I used size 4.8 x 0.8) Place on a baking sheet & set aside. In a medium bowl mix together your filling ingredients. In a separate medium-sized bowl, whisk together all your topping ingredients (except the coconut oil.) Once dry ingredients are well-combined, add in your cold coconut oil & combine until mixture forms into little pea-sized balls. Let cook for 25-30 minutes. Remove from oven. Cool for 10-15 minutes & enjoy! Let’s talk eggs! Do you know the difference between conventional eggs vs cage free organic eggs? Conventional eggs come from hens that are typically fed grains, corn, soy & an unnatural diet of supplemented vitamins + minerals. Cage-free organic eggs are laid by cage-free hens that are raised on certified organic feed with access to outdoors. Because of this, cage-free organic eggs are naturally higher in vitamins A, E, & omega-3s. If you’ve ever cracked & compared the yolks of a conventional egg vs a cage-free organic egg, you can literally see the difference. The conventional egg yolk is pale in color typically because the hens had no access to the outdoors & are fed mainly grains. While the cage-free organic egg yolk is bright orange in color which typically indicates the hens were fed a well-balanced, nutritional diet with access to sunlight. Being someone who truly cares where my food comes from, I love working with local companies like Chino Valley Ranchers. They simply let chickens do what they are supposed to do. Chino Valley hens are fed the highest-quality organic feed from certified pesticide-free fields, & have access to soil & vegetation where they can dust bathe, scratch, & fresh air. They always have unlimited access to fresh food + water & sometimes they choose to forage for food outdoors. Matt eats eggs more than any other food in his diet. So it’s incredibly important to me to purchase our eggs from companys like Chino Valley! 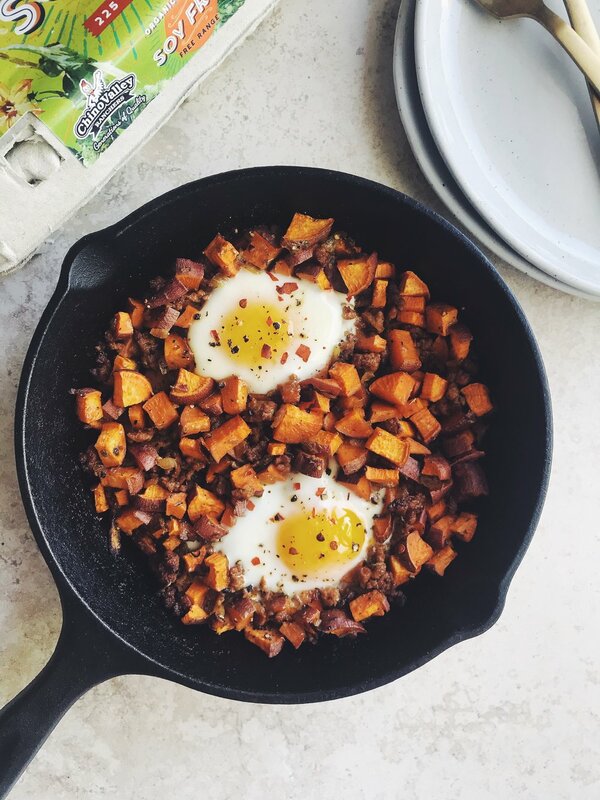 Over the weekend, I made a spicy sweet potato hash with organic soy-free eggs nestled in the skillet. It was so simple & we’ll definitely be making this a regular thing! Heat 2 tbsp avocado oil in a large skillet over medium heat. Add in your diced onion & begin to sauté until soft + translucent (about 5-8 minutes.) Add in your minced garlic & sauté for another minute. Then crumble in your ground chorizo & sauté until cooked through. Add your chopped sweet potatoes + spices to your cast iron skillet with your onion mixture. Fold together until well-combined. Pop in the oven for 20-25 minutes or until sweet potatoes are soft. Carefully remove skillet from oven. Make two wells in the skillet & crack your eggs into them. Place back in the oven for 6-8 minutes or until eggs are cooked to your liking. Remove from oven, serve & enjoy! Preheat oven to 325. Line a large baking sheet with parchment paper & set aside. In a food processor or vitamix, pulse all your nuts + seeds together until finely chopped, but not into a flour. Pour mixture into a large mixing bowl. Stir in maca powder, ground cinnamon & pink salt until combined. In a medium saucepan over low-medium heat, melt the coconut oil. Remove from heat & whisk in the Dark Chocolate Cashew butter, maple syrup, flax egg & vanilla extract until well combined. Fold your wet mixture in with your dry mixture. Once incorporated, press out mixture onto your parchment-lined baking sheet. About 1/4 inch thickness. Pop in the oven for 25-30 minutes. Remove from the oven & let cool completely until breaking into chunks. Store in an air-right container & enjoy throughout the week with your favorite plant-based milk, yogurt, or smoothies! Heat 2 tbsp avocado oil in a large stock pot over medium-high heat. Add in your diced onion, bell pepper + celery. Sauté for 5 minutes or until the onions start to become translucent. Add in your zucchini + minced garlic & continue to sauté for another minute. Then toss in your chopped sausage, cajun seasoning, hot sauce, pink salt, & pepper. Cook for another minute, stirring until well combined. To the pot, carefully add in your diced tomatoes & bone broth. Reduce heat to low, cover & let simmer for 20-30 minutes. After you’ve let simmer, add in your cauliflower rice & shrimp. Stir to combine & let simmer until the cauliflower rice is warmed + the shrimp is cooked through. Serve & top with sliced green onions. Enjoy! If you’re trying to cut caffeine, need a break from coffee or simply want to try something new, MACA CHOCO is for you! For me, nothing beats this coffeeless-cup-o’-cozy every single morning. My Maca Choco’s have truly become an integral part of my morning routine over the past year & I love it. I haven’t had coffee in over 15 years because caffeine triggered panic attacks when I was younger. Also, PCOS + caffeine are definitely not a match made in heaven. BUT I’ve always envied that morning routine that coffee drinkers would have + that little burst of energy to start the day. So, this drink has definitely become that for me. add all ingredients to your high speed blender & blend for 30-45 seconds until frothy. to enjoy hot: pour mixture in a small saucepan over medium heat until warm & enjoy! to enjoy cold: simply pour mixture over ice & enjoy! *Notes: Can use 1 1/2 cup fine almond flour instead of grain-free granola. Add the 1 1/2 cups granola to a food processor, & pulse until fine. Add in the rest of your ingredients & blend until dough is formed. Press dough into your pre-lined baking dish & pop in the oven for 14 minutes. While crust is cooking, make your filling. Add all your filling ingredients to a cleaned food processor or a high speed blender. Blended until smooth, creamy & well combined. Once crust is done, remove from oven & let cool for 10-15 minutes. Pour filling mixture over crust, sprinkle with sea salt + chopped almonds. Pop in the fridge to set for 1 hour (or freezer for 30 minutes) before slicing & serving. Keep leftovers stored in the fridge or freezer, enjoy! If having chips for breakfast is wrong, I don’t want be right! Matt basically has the same thing for breakfast every single morning: eggs. Eggs being something he consumes EVERY single day, I always make sure we’re buying quality-sourced organic free range eggs from chickens that are treated with care from Chino Valley Ranchers! Chino Valley’s hens have been treated with respect & care since the company started three generations ago, which says a lot about their mission & their family as a whole. These chilaquiles are such a fun break from your everyday breakfast. Perfect for a brunch with friends, sharing, or eating all to yourself! In a 6.5 inch cast iron skillet sauté onions in avocado oil over medium-high heat until starting to become translucent. Stir in your chipotle pepper paste + salsa & simmer for 3-5 minutes. Slowly fold in your tortilla chips to the skillet. Making sure to cover each chip with the sauce. Make a small well in the middle of the skillet & crack your egg into it. Cover skillet with foil & place in the oven for 5 minutes. Remove foil & cook for another 3-5 minutes or until yolk is set to your liking. Take skillet out of the oven & garnish with avocado, cilantro & green onions. Enjoy! The other day Little Northern Bakehouse sent me some of their plant-based gluten-free breads & my first thought was literally: “what if my pecan pie bites & french toast made a baby...” & then whatdya know, this PECAN PIE FRENCH TOAST BAKE was born! My dad loves pecan pie anytime of the year (& so do I) but especially around the holidays. Over the years I’ve learned to adapt my favorite holiday comfort foods for myself + my family by removing the gluten/dairy (to keep my PCOS symptoms at bay.) Without sacrificing any of the deliciousness, of course! So I figured combining one of our favorite pie fillings with a classic like french toast had to be a home run. & let me tell you, it was! I used Little Northern Bakehouse’s Millet & Chia bread & basically poured my pecan pie bite filling all over it! Seriously cannot wait to remake for my fam on Christmas morning! Preheat oven to 375 & oil a 6.5 inch cast iron skillet with some coconut oil. Cut each slice of bread in half & line the cast iron with the halved slices, starting from the outside-in. In a pot over medium heat, whisk together coconut milk, coconut oil, coconut sugar, maple syrup, vanilla, collagen if using, cinnamon & pink salt. Whisk constantly until mixture starts to thicken (8-10 minutes.) Remove from heat & fold in your flax egg + pecans. Pour mixture over bread in your cast iron skillet. Making sure to let the mixture soak in between slices. Remove from oven & let cool for 10 minutes before serving. Enjoy! Oil a baking dish & preheat your oven to 375 degrees. Place your quartered acorn squash in the pre-oiled dish & brush with 1 tbsp avocado oil, a pinch of pink salt n pepper. Place in the oven to roast for 30 minutes or until soft. While squash is roasting. Start sautéing your diced onion in 1 tbsp avocado oil over medium-high heat. Once onion starts to become translucent, add in your chicken sausage, garlic powder, Italian seasoning, balsamic vinegar, maple syrup, salt n pepper & start to brown. Once sausage is cooked through, fold in your thyme, cooked rice & chopped cherries. Remove squash from the oven & spoon sausage + rice mixture in to squash boats. Place back in the oven for 15 minutes. While the squash is in the oven, make maple tahini sauce by whisking all ingredients in a small bowl until well combined. These cookies scream spring! They are the perfect balance of tart 'n sweet. The best part though: you only need 6 ingredients to throw these cookies together! Preheat oven to 350 & line a baking sheet with parchment paper.Whisk all your wet ingredients in a medium sized bowl until well combined. In a large separate bowl, combine all dry ingredients. Pour the wet ingredients in with the dry & stir until it starts to form into dough.Roll your dough into 1 in balls & place on your pre-lined baking sheet, making sure to leave about 2-3 inches in between each ball. With the back of a spoon, flatten balls a bit (they won’t spread much in the oven) so try to get them close to cookie shape. Pop in the oven for 12-15 minutes or until golden brown. Once done cooking, remove from the oven & let rest on baking sheet until cooled! Store in an airtight container on the counter for 3-5 days or in the fridge for up to a week. Enjoy! MAPLE CINNAMON, incredibly nutrient-dense, sugar-free, loaded with healthy fats, protein, & legit tastes like I’m eating pancakes loaded with maple syrup. Need I say more? Add everything to a food processor & pulse until combined (scrapping down the sides every so often.) If the fat ball dough isn't blending together, just add a little bit more cashew milk. Roll the dough into balls of desired thickness. Place on a tray lined with parchment paper & pop in the freezer to freeze their shape. Once hardened, place balls into an airtight container & store in the freezer. Take out a couple minutes to soften a bit before enjoying! All I have to say is thin mints girl scout cookies. That's totally what these fat balls taste like - without all the junk, of course. Perfect pre/post workout treat, anytime of the day snack, or on-the-go bite! Add everything to a food processor & pulse until combined (scrapping down the sides every so often.) If the fat ball dough isn't blending together, just add a little bit more almond milk.Roll the dough into balls of desired thickness. Place on a tray lined with parchment paper & pop in the freezer to freeze their shape. Once hardened, place balls into an airtight container & store in the freezer. Enjoy! These brownies ya'll! They happen to be gluten free, vegan, refined sugar-free, & full of healthy fats + protein. Perfectly sweet, extra decadent, & fudgy! Pre-heat your oven to 350F & line a 9x9 in. baking dish with parchment paper (for easy removal. )In a medium bowl, whisk together the almond flour, chickpea flour, cacao powder, baking soda, baking powder, & pink salt.In a stand mixer mix together the almond butter, melted coconut oil, maple syrup, coconut sugar, almond milk, flax eggs, & vanilla until well combined. (If you don't have a stand mixer you can simply just whisk the ingredients together in a large bowl. )Pour the dry ingredients into your stand mixer (or large bowl) to combine with the wet ingredients until combined. Fold in your chopped chocolate.Pour brownie batter into your pre-lined baking dish. Top with your toppings (optional) & pop in the oven for 45 minutes or until a toothpick is inserted in the middle & comes out clean.Let cool completely & slice into squares. Store in an airtight container on the counter or in the fridge to last longer. Enjoy! Who doesn't love rice crispy treats?! This recipe is perfect for the holidays! It's gluten free, dairy free, vegan & takes no time to throw together. Perfect for that holiday party or homemade gift. Line a 8x8 in. baking dish with parchment paper & set aside. Heat raw honey + maple syrup in a saucepan over medium-high heat until it reaches a simmer (about 5 minutes. )Stir in Chocolate Power Fuel, coconut butter, vanilla, peppermint & salt. Lower heat & continue to cook for another 5 minutes, frequently stirring. Remove from heat. add sauce to a large mixing bowl. Slowly stir in brown rice cereal until well combined.Pour & spread out into pre-lined baking dish.melt your chopped chocolate over a double boiler with 1 tbsp of coconut oil. Once smooth, pour over the top of the rice crisps - making sure to evenly cover the top. Sprinkle with crushed peppermint candy (if using) + a pinch of sea salt. Pop in the refrigerator for an hour to harden & set. Once hardened remove from refrigerator, slice & enjoy!